MUSE article in the October issue of Electronic Musician with Matthew Bellamy discussing "The 2nd Law" album: On the album opener 'Supremacy,' Bellamy's passionate vocal cry morphs into a screaming guitar solo..."That's two [Tech 21] SansAmps with the lead vocal down the middle," Bellamy explains. "The SansAmp on the left had a 45-millisecond delay. The distortion is in stereo, but the main vocal was dry and right down the middle. You get this big-sounding vocal, but it evokes guitar as well because it's going through a SansAmp guitar simulator. It creates this strangely large, chorus distorted sound." >My distorted tone comes from my Sansamp GT2 guitar pedal, it's my secret weapon. This video from DunlopTV features the guitar tech of TOOL's longest acting bassist, Justin Chancellor. 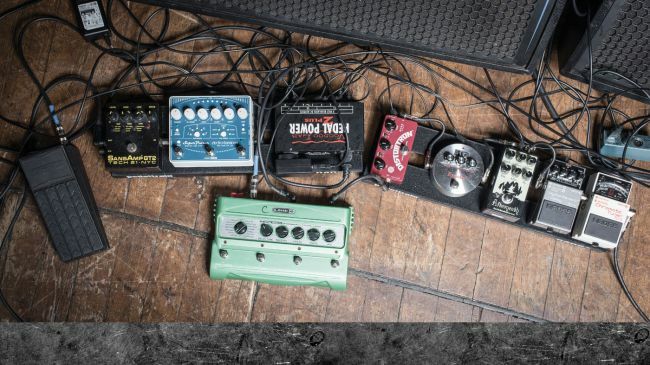 As he runs through some of the pedals within Chancellor's pedal board, we see that the over-all board is in 3 sections. The camera does a tightly zoomed pan of the board and shows the Tech 21 SansAmp GT2 Pedal. According to this Premier Guitar article, Chi Cheng used a SansAmp GT2 for the majority of his bass playing. In this Tweet posted by Malkmus, the SansAmp GT2 emulator is visible. He uses this pedal for gain and grit, according to Premier Guitar's rig rundown. > For the distorted sound I mix in, I'm currently using a Tech 21 SansAmp GT2 guitar distortion." The GT2 is shown in the list, picture, and video. In [this interview with Premier Guitar magazine](http://www.premierguitar.com/articles/22907-metz-alex-edkins-relentless-aggression?page=2), Edkins explains his pedal setup. "I use a Pro Co Turbo RAT, straight up, almost all the time. I sometimes run a SansAmp GT2 to boost the RAT a bit more, and a couple of delays. But that’s it." Marnie Stern did an interview in Guitar Player where its revealed: “When you’re trying to accent a lot of notes at once, you want the tone to be clear,” says Stern, who eschews high-gain rigs in favor of a beat-up old Fender Deluxe Reverb overdriven by a SansAmp GT2 pedal (which she also uses as an amp/cab simulator for direct tracking). In the description It said: "Equipment used in this song: Korg Polysix, Poly 61 (through a SansAmp GT2), Mono/Poly, Micro-preset M500; Roland TR-808, Jomox AirBase99, Juno 60, Alpha Juno 1&2; Touched-by-sound DRM1, Oberheim Matrix 6R, Yamaha RM1x (only for MIDI sequencing), Behringer DDX3216, Lexicon MPX500, as well as a midi patchbay and additional preamps for my mixer. Cameras: Canon HF100 (x2) and HF200." In the Facebook photo taken by Erin regarding his new Pigtronix Looper, he has a SansAmp GT2 by Tech 21 on the bottom of the board. Artist said: " astroflexagram@astroflexagram #pedalboardfreak #shoegaze #guitarporn #spaceecho #electroharmonix #deluxememoryman #bigmuff #mxr #phase90 #dittolooper #bossps3 #smallstone #ravishsitar #twintube #tech21 #sansamp #pulsar #greenmachine #aramateffects #bossdd5 #bosstu #guitareffects #guitarfx #seymourduncan #1spot #geartalk #pedalboard #alienspacebuttons #drugs #toys Foto: @renconde"
This video (which has since been deleted) shows Rainbow giving a tour through his home studio. At around 2:45 he shows the Yamaha PSR-36 which has 3 effect pedals on top of it. The black one on the right can be identified as a Tech 21 SansAmp GT2. I used a lot DS-1, DS-2, Metal Muff, but this has a place in my pedal board. It is very versatile and always find myself with it, regardless of the guitar or pickup that I'm using. I found this in a box of junk.... I don't remember buying one so someone must have given it to me years ago. I started using it recently for nasty DI guitar sounds and I really like it. You have to embrace the fact that its not replacing an amp but it has a sound of its own that's pure trash. Amp modelling before it existed. Completely analogue and just great sounding. It's good, a little noisy. I use this as a clean boost, and it's perfect as a boost, just a little noisy. I have a DIY version (replica) of this unit, the SinAmp. The sounds are amazing.